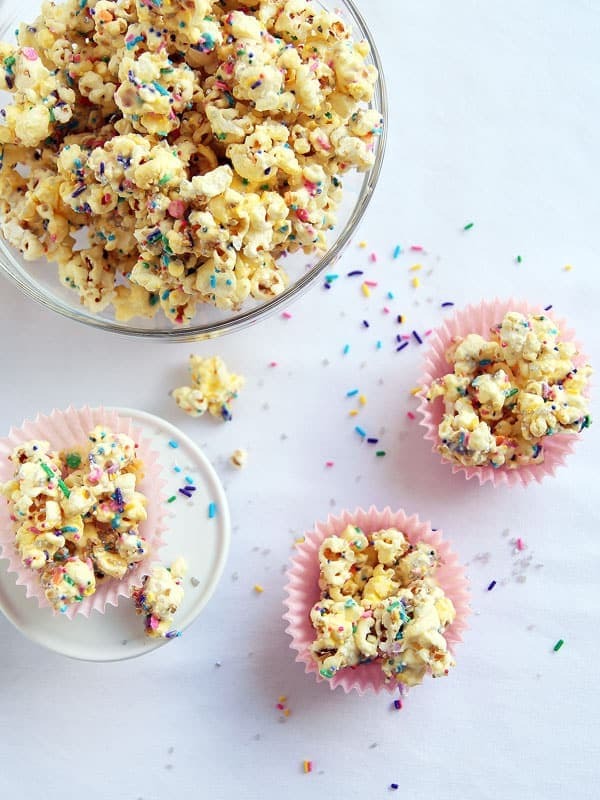 Buttery popcorn taken up a notch with color sparkling sprinkles – enjoy this Funfetti Popcorn recipe! A treat guaranteed to impress at the next birthday party. 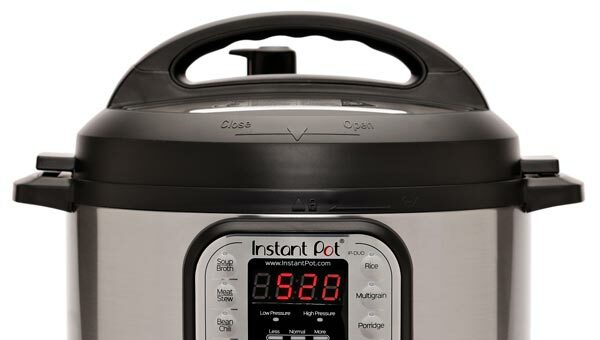 Plus, it is super quick to prepare. So, I told you how my sister and I went to see Chef at the movie theater last week. Of course, we had to get some popcorn, despite just having had dinner. It’s just a natural thing to do… I know you understand. Popcorn just goes hand-in-hand with a movie. Well, we got a big bag to share between the two of us. That’s what I always do with my husband and there are never leftovers. Not so this time. We barely had half of the bag. So, when the next day this bag of movie theater popcorn greeted me on the counter, I knew I had to get creative with it. After all, it’s been over a year since I made fancy popcorn munch. And what better and fun way to get creative with than SPRINKLES!? 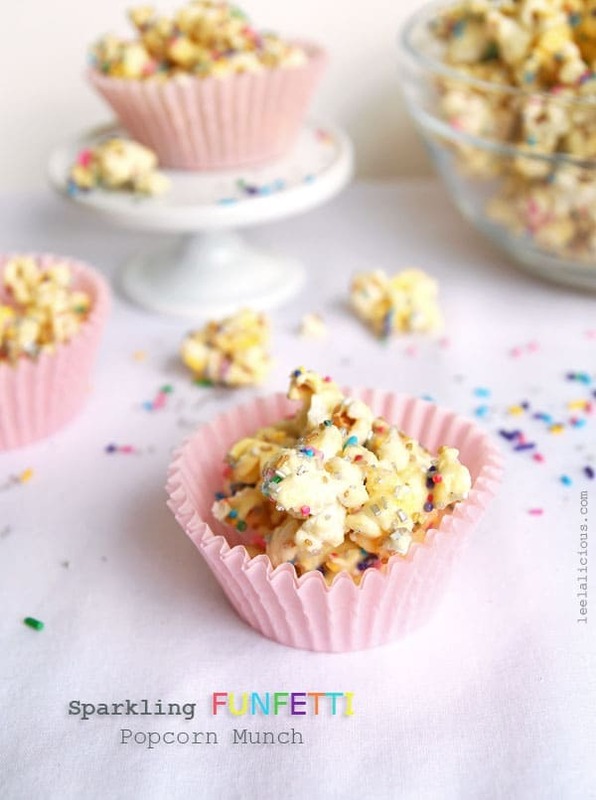 I can totally see this Sparkling Funfetti Popcorn at a birthday party real soon. For a princess birthday party, you could even use pink candy melts instead of white chocolate. And, there is something I can see in the near future – more popcorn munch! 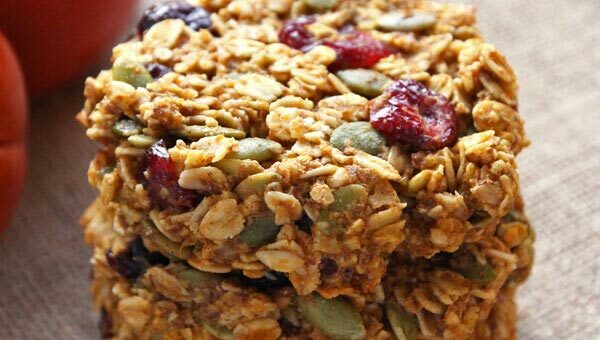 Its a perfectly quick, no-bake treat for summer and the variations are endless. So get ready for more ‘creative popcorn‘. Firstly, I’ll add that you don’t want to make popcorn that has already gone bad. To avoid this, only use leftover popcorn that has been left over for 2 days or less, just to be on the safe side. I don’t want to lead you into a regrettable snack/dessert, after all. Secondly, make sure you line your baking sheet so that nothing sticks and the clean up happens in a jiffy afterwards! 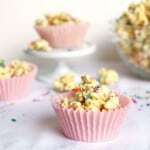 Buttery popcorn taken up a notch with color sparkling sprinkles - enjoy this Funfetti Popcorn recipe! A treat guaranteed to impress at the next birthday party. 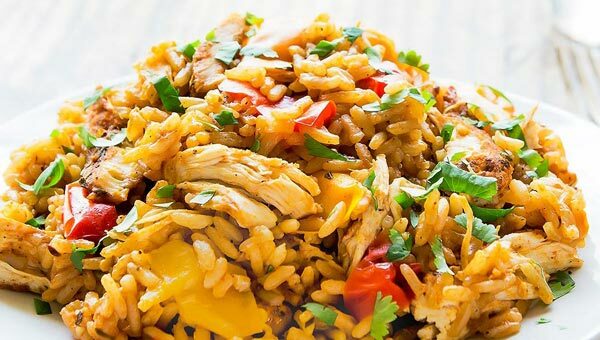 Plus, it is super quick to prepare. Place popcorn in a large bowl. Melt white chocolate in a water bath on stove top or in the microwave (15 second intervals). Drizzle over popcorn and toss. Add funfetti sprinkles and toss again. 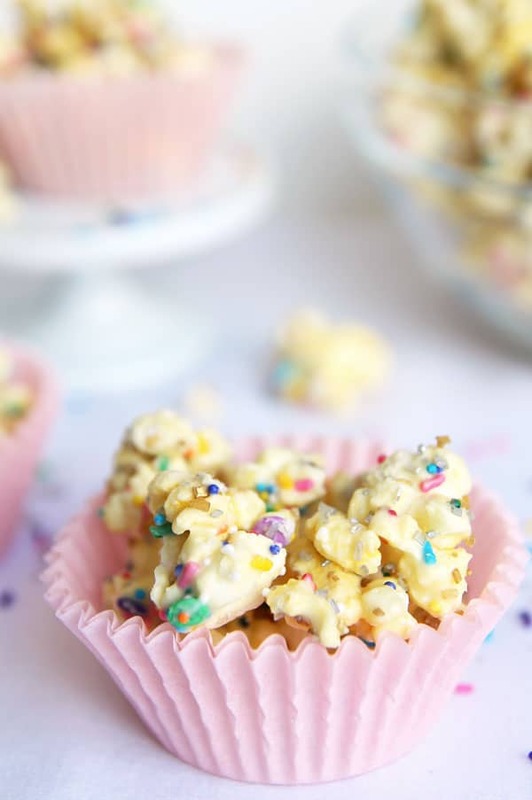 Spread popcorn on a lined baking sheet and sprinkle with sparkling sprinkles over top. Chill until set, then break into chunks. Store airtight. 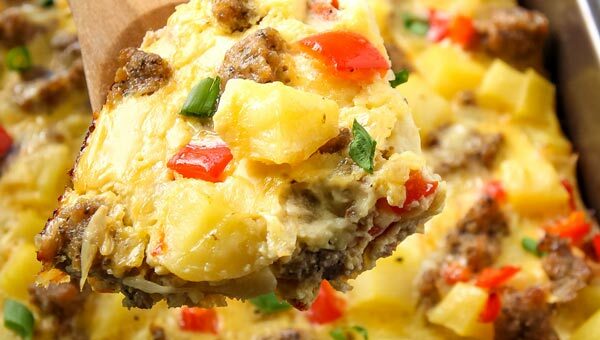 The recipe can also be easily multiplied. 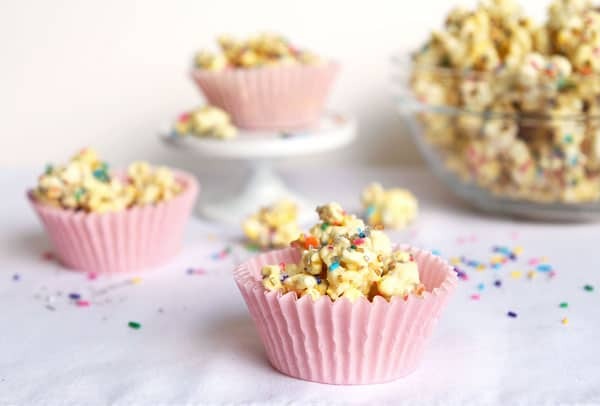 * I reviewed the best popcorn poppers for home here. That’s ma gurrl!! Who doesn’t love bling? !